Statment to the 19th Conference of States Parties to the Chemical Weapons Convention given by Dr Michael Crowley, Bradford Non-Lethal Weapons Research Project, University of Bradford. On behalf of Bradford Non-lethal Weapons Research Project and the Biochemical Security 2030 Project, University of Bath. These reccomendations are based upon the report ‘Down the slippery slope? A study of contemporary dual-use chemical and life-science research potentially applicable to incapacitating chemical agent weapons‘ (Policy Paper 8, Biochemical Security 2030 Policy paper series)- Written by Dr Michael Crowley and Professor Malcolm Dando. Madam Chair, Director-General, Your Excellencies, Ladies and Gentlemen. The following remarks draw upon a recent Bradford University study, being distributed today, which examines dual-use chemical and life science research potentially applicable to incapacitating chemical agent (ICA) weapons. Whilst the use in armed conflict of weapons employing ICAs is clearly prohibited under the Chemical Weapons Convention, there are differing interpretations as to whether such weapons can be employed for law enforcement purposes. To date there has been one well-documented use by a CWC State Party of an ICA weapon in a large-scale law enforcement and hostage rescue operation in 2002. The State Party concerned has not publicly confirmed the identity of the ICA weapon employed nor whether it holds stockpiles of such weapons. Our study indicates that scientists in that country have subsequently undertaken research potentially applicable to ICA weapons, including computer modelling of so-called “calmative” “gas flows” in enclosed spaces, and the exploration of opiate receptors and their interaction with potential ICAs. Our study also highlights the development and marketing by companies in a second State Party of an ICA weapon employing an unknown anaesthetic agent specifically promoted for use by security forces against individuals, and the possession of such weapons by the security forces of that country at least up to 2012. A third country has previously conducted research into ICAs, and on at least one occasion its security services employed an ICA weapon targeted against an individual, in 1997. Although it is apparent that ICA weapons have been developed in at least three countries since the coming into force of the Convention, the situation in other States is much less clear, due to difficulties in establishing the nature and purpose of potentially relevant chemical and life science dual-use research. The potential for false perceptions about current State activities and misunderstandings about State motivations behind such dual-use research, are exacerbated by the lack of effective OPCW reporting or transparency mechanisms in this area. In addition, and more critically, no OPCW policy making organ has issued clear guidance as to whether ICA weapons can be legitimately employed for law enforcement purposes and if so, under what circumstances, and with what constraints. Consequently, individual States Parties are left to interpret the scope and nature of their obligations in this area, with the consequent risk that a permissive interpretation may emerge. Recognising the potentially dangerous implications of such developments, certain States, including Australia, Canada, Germany and Switzerland have rejected the option of weaponising ICAs, formally declaring that the only toxic chemicals that can be employed for law enforcement purposes in their countries are riot control agents. In addition, the United Kingdom and the United States have formally declared that they are not developing and do not possess ICA weapons. 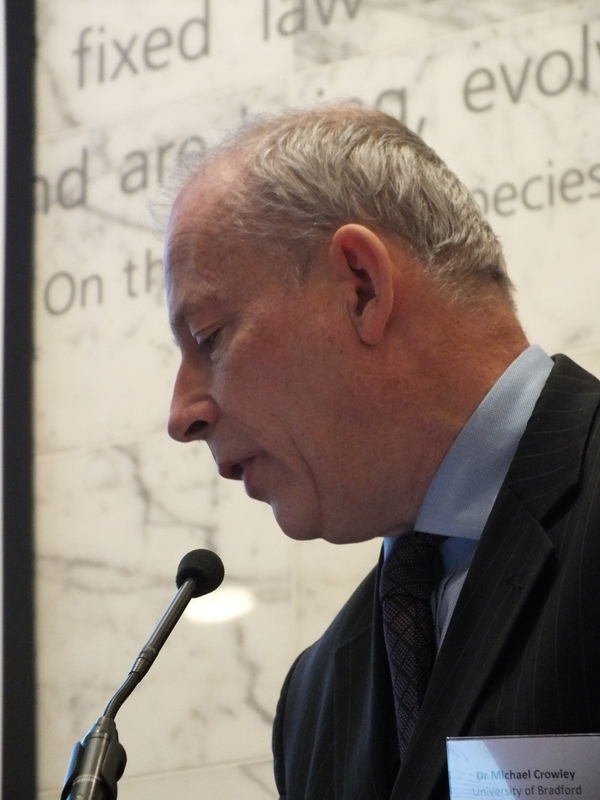 Dr Michael Crowley, Presenting aspects of the paper at the ‘Biological and Chemical Security in an Age of Responsible Innovation’ held at the Royal Society, November 2014. Image R.Guthrie. However, certain States that appear to possess ICA weapons or that have conducted research that may be applicable to the study or development of such weapons, remain silent. In order to address concerns and prevent possible mis-perceptions, these countries should make formal statements during this Conference or in other appropriate fora clarifying the nature and purpose of relevant research activities and on whether they are developing, stockpiling or allow the use of ICA weapons for law enforcement purposes. (b.) Affirm that current national practice is to restrict use of toxic chemicals for law enforcement to riot control agents. Where such restriction is not existing policy, States should – as a minimum – introduce national moratoria halting the initiation or continuation of development, possession and use of ICA weapons intended for law enforcement. Like-minded States could also introduce a moratorium on such activities at the pluri-lateral level. (c.) Fulfil existing CWC reporting obligations – including those under Article X requiring State Parties to report relevant research for “protective purposes” to the Technical Secretariat – and introduce additional transparency mechanisms. Because the possession of ICA weapons currently appears to be restricted to a relatively small number of States, there is still time for the international community to take appropriate action. weapons development programmes, or may be perceived – rightly or wrongly – of doing so. This, in turn, may convince further States to conduct their own ICA weapons programmes or potentially explore an even broader range of chemical agents, with the danger of a consequent spiral of actions and reactions that could weaken or eventually erode away the prohibition of chemical weapons. Thank you for your kind attention, and I request that this statement be made part of the CSP record. Cover image courtesy of the the OPCW.